Raw honey, honey in its purest form before pasteurizing, filtering, straining or heating, is high in essential vitamins and minerals. 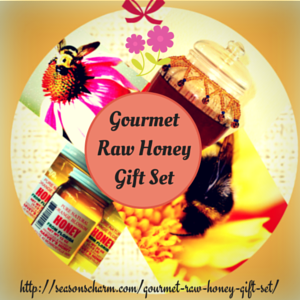 Whether for birthdays, housewarming, Christmas or gifts for any occasions, the gourmet raw honey gift set is a lovely idea. A delicious gift that you can use on bread, biscuits, bagels instead of jams and jellies, this Organic Mountains wildcrafted fat and cholesterol free gourmet raw honey gift set consists of 3 varieties namely Sourwood, Wildflower and Orange Blossom. Spread some Sourwood honey with its light, buttery maple flavor on croissants or biscuits. Delicious! Wildflower honey with its floral aroma and taste works great if gently stirred into a cup of tea giving it a floral scent. Orange Blossom has a unique citrus flavor. Match it with White or Oolong tea and you have a cup of aromatic healthy tea. To be stored upside down, these delicious honey are bottled in its natural raw state in convenient plastic squeeze bottle with a patented dripless lid. This preserves their nutritional value and rich exquisite natural flavor. 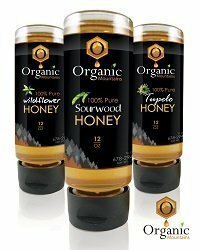 The Organic Mountains Raw Sourwood, Wildflower, Orange Blossom Honey makes a great gourmet raw honey gift set idea for housewarming. In fact, it is a wonderful gift for all occasions.